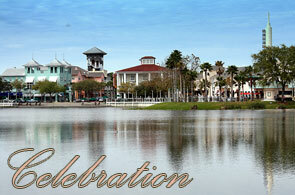 Celebration, Florida is a planned community created by the real estate development division of The Walt Disney Company. The Disney Company commissioned famous architects to create the master plan and to design the buildings for the community. Established in 1994, Celebration has the flavor of a southern American village from the 1930s. About 2,500 homes are clustered around a small, pedestrian-friendly shopping area. The first residents moved in during the summer of 1996, and the Town Center was completed that November. Celebration is often cited as an example of New Urbanism, or neo-traditional town design. Celebration, Florida is a planned community created by the real estate development division of The Walt Disney Company. The Disney Company commissioned famous architects to create the master plan and to design the buildings for the community. Established in 1994, Celebration has the flavor of a southern American village from the 1930s. About 2,500 homes are clustered around a small, pedestrian-friendly shopping area. The first residents moved in during the summer of 1996, and the Town Center was completed that November. Celebration is often cited as an example of New Urbanism, or neo-traditional town design. In 2004, the Disney Company sold the 16-acre town center near Orlando to Lexin Capital, a private real estate investment company. However, Market Street still has a storybook atmosphere that some visitors call "Disney-esque." There is a Caribbean flavor to many of the buildings here. Sided in brightly-colored stucco, the Market Street buildings have wide overhangs, shutters, verandas, and arcades.